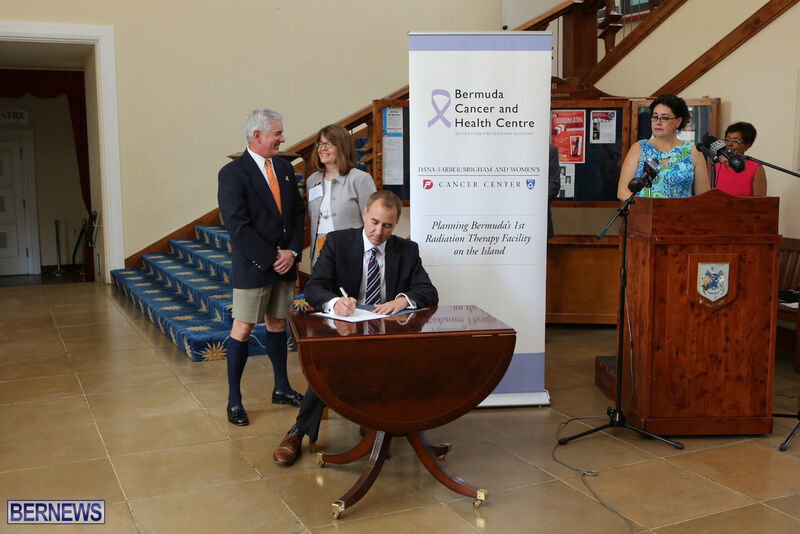 Bermuda Cancer and Health Centre and Dana-Farber/Brigham and Women’s Cancer Center [DF/BWCC] yesterday [Sept 17] signed a Memorandum of Understanding to collaborate on the development of a radiotherapy program. “This is the next very important phase in developing radiation therapy plans for the local treatment of cancer patients in Bermuda. Bermuda Cancer and Health Centre recognizes how crucial it is to establish collaborative clinical affiliations with overseas cancer centers so that we will safely and effectively provide the highest quality level of cancer care locally,” said Bermuda Cancer and Health Centre, Executive Director, Tara Scares. A spokesperson said, “Experts from DF/BWCC will advise Bermuda on issues related to the development of the program, including design of a facility, the creation of clinical radiation oncology policies, procedures and safety protocols and the development of a training and education program. 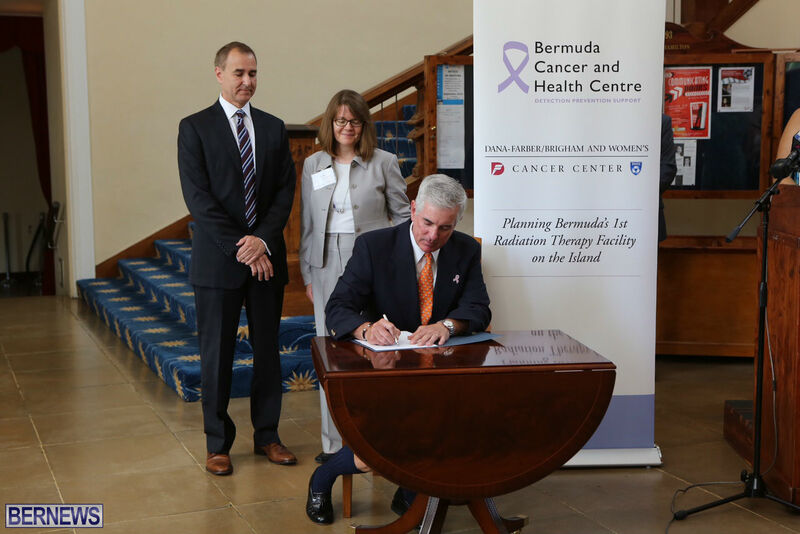 “We are excited to partner with Bermuda Cancer and Health Centre to expand the radiation oncology services available to patients in Bermuda. We share a commitment to providing patient and family-centered care, and through this partnership, most patients who require radiation therapy will no longer need to travel off the island to receive high quality care,” said Daphne Haas-Kogan, MD, chair, Department of Radiation Oncology, Dana-Farber/Brigham and Women’s Cancer Center and professor at Harvard Medical School. 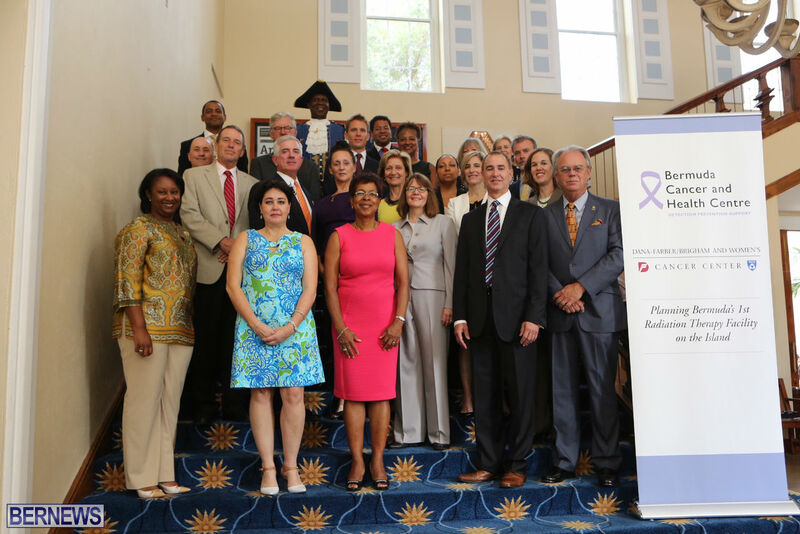 “The impact of an expanded cancer care program will not only address escalating health care costs for the country, it will also make care more efficient and less stressful for Bermudians. 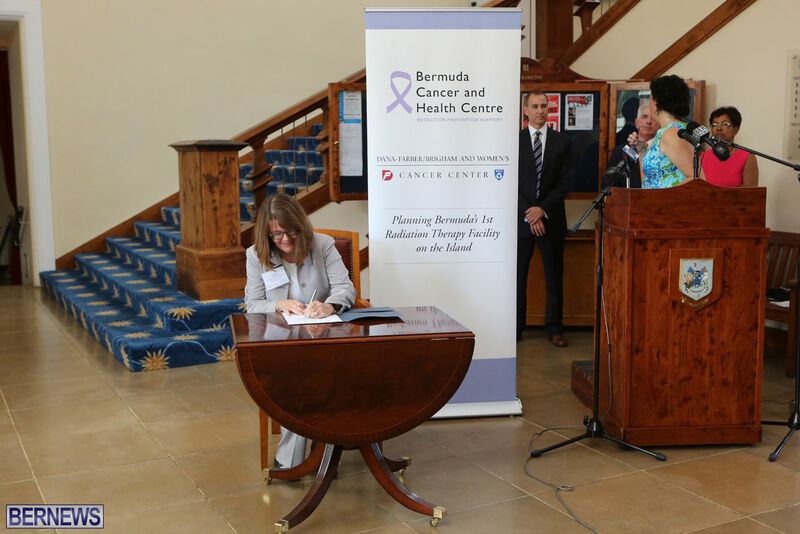 The partnership between DF/BWCC and the Bermuda Cancer and Health Centre marks another important milestone in the work we do on the island,” said Dr. Gilbert H. Mudge, CEO for PHI. Chairman of Bermuda Cancer and Health Centre’s Board of Directors, Glen Gibbons said, “Dana Farber / Brigham and Women’s Cancer Centre is ranked the fourth best hospital for adult cancer treatment in the United States, according to the US News Best Hospitals Rankings for 2015. “Radiation Therapy is currently not available in Bermuda and therefore people can only receive this type of treatment if they go to an overseas facility. Being overseas, for an extended period of time, can be very complicated for many people. “Long absences from home and loved ones, leave of absences from work and additional costs and out-of-pocket expenses can be some of the hardships people may face. Hm….. These workers in Bermuda are , in no way, as skilled or as qualified as those at Brigham & Women’s hospital. Who will be first, as the unskilled learn how to become better skilled on people? How long will such training take? Exactly who will be trained? What about human errors? How will be punishable by law? ?There are no laws ,in Bermuda, which protect people from medical blunders. Once again, hmmm…..!!!! Shut up idiot. Maybe you should offer yourself up to be tested first as you would be of no real loss should any “blunders” happen. Poor thing, you are!! !Have YOU ever received radiation treatment? Doubt it! !You FAIL to think humanely! !Poor thing!! Yes because us poor dumb Bermudians aren’t qualified to do anything, we’re just backwards idiots who dance around in grass skirts. So was that a yes? I know you’re being facecious when you say we bermudians are dumb…but not too many are bright from some of the comments they write. Hmm….. This is interesting! With the installation of these new devices, who is held accountable IF there are serious errors to persons? What specific laws are in place to ensure that people are protected from medical errors? Brigham & Women’s hospital is amongst the best in the world. Specialists in radiation treatment , in Bermuda, MUST be trained. The Bermudian public must be aware that there are NO LAWS to protect them if there are errors. Hmm….. Sometimes commonsense aren’t too common…One would believe them that will be operating this particular piece of equipment will be fully qualified, lessening any error/s Stop with the negative bull-crap u’lot. It will be a big savings to everyone having this on hand as oppose,(for some)having to go through so many loopholes to be treated overseas in the U.S.A.
Lmfao here…you people are worrying about how to sue people for “human errors”..?? HELLO!…YOU ARE VOLUNTEERING YOUR SELF TO A DESTRUCTIVE PROCEDURE…After radiating yourself then go for more destruction CHEMICAL THERAPY…just what the human body needs…ask any biochemist. Scary thought to have radiation done here. I feel there are many other cancer cures .Korea apparently has one…marijuanna is documented to…documented…to be a cure…..irradiation in this island?…would be quite irresponsible….i don’t feel the need to eleiviate!